Instant Pot Shredded Chicken is an easy chicken dinner in 30 minutes! Use the pressure cooker to make enough shredded chicken for dinner all week use it for meal prep to eat healthier lunches! If I’ve found one thing that helps me eat healthier it’s meal planning and prep. If I don’t have my meals planned for the week I will make unhealthy meals or grab takeout; if I don’t have my lunches prepped I’ll eat bread and cheese. I decided that I’m going to make an effort every week to do some meal prep. I started last week and it worked: I never wondered what was for lunch and getting dinner on the table was easy. Chicken is the protein that we eat most often, so that’s where I started for my meal prepping. Having a large batch of shredded chicken in my fridge makes it so easy to make lunch and dinner. I also made rice at the same time and I’ll have a few new easy recipes for you in the coming days! First of all, y’all need an Instant Pot if you don’t have one. Any electric pressure cooker is fine, but if you don’t have one yet, go with the real thing. (I have another brand and don’t like it near as much as my Instant Pot.) I don’t work with Instant Pot (hey guys! call me!) but I truly love this product. I know it’s a pain to have so many kitchen appliances, but this one is worth it. I know that you can make slow cooker shredded chicken but trust me when I say that it tastes better in the pressure cooker. Everything tastes better pressure cooked over slow cooked, I’m finding. 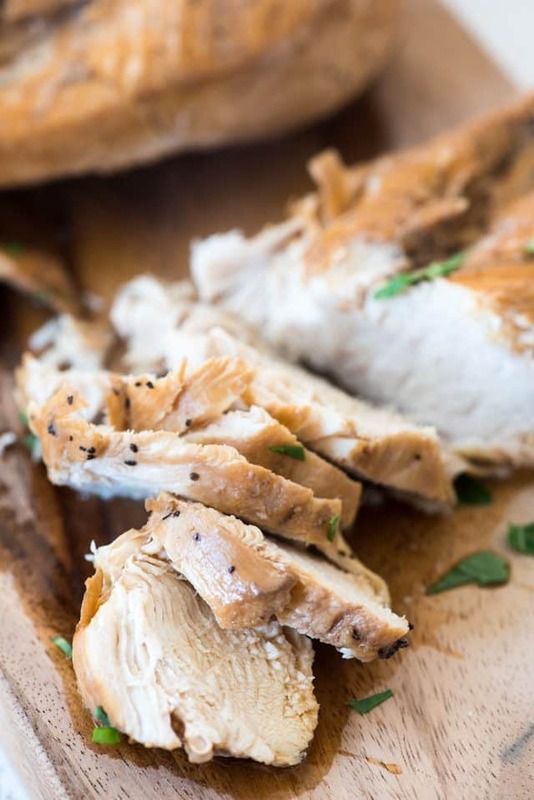 I have another instant pot chicken recipe that’s really great for sliced chicken. I wrote this recipe especially for shredded chicken and it’s perfect for using in meals all week long. 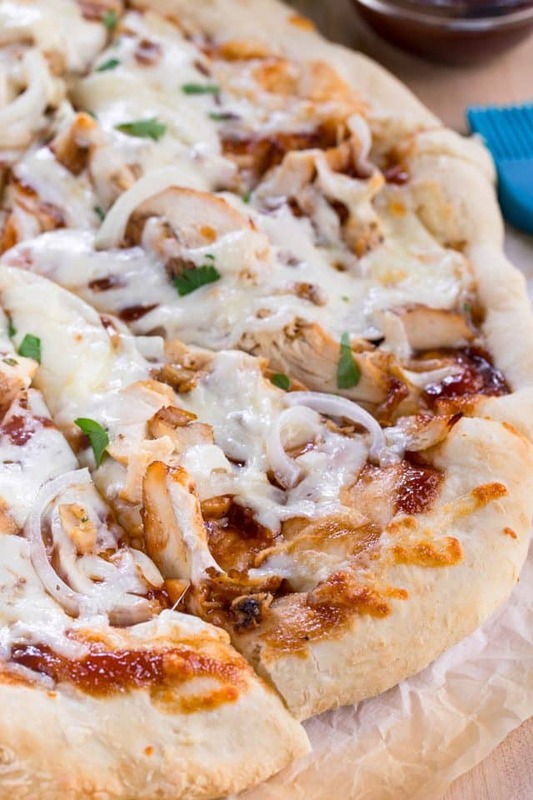 Need shredded chicken recipes? Check out my list below. 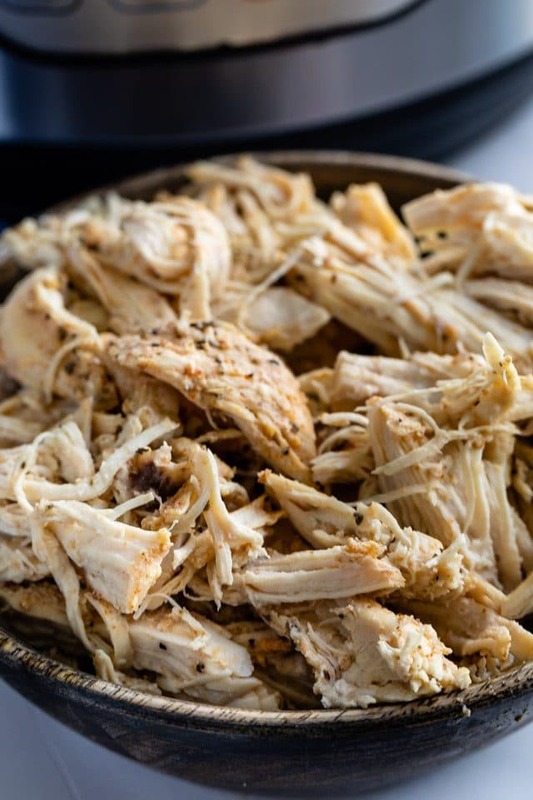 This easy instant pot shredded chicken comes together in just a few seconds really, then cooks on its own. The key to making good chicken is seasoning, no matter what appliance you’re using! 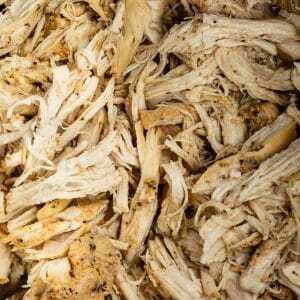 What liquid do you add to the pressure cooker to make shredded chicken? I add a cup of chicken broth or stock and 1/4 cup of pineapple juice. The juice adds a little sweetness to the mix. If you don’t have pineapple juice you can omit. 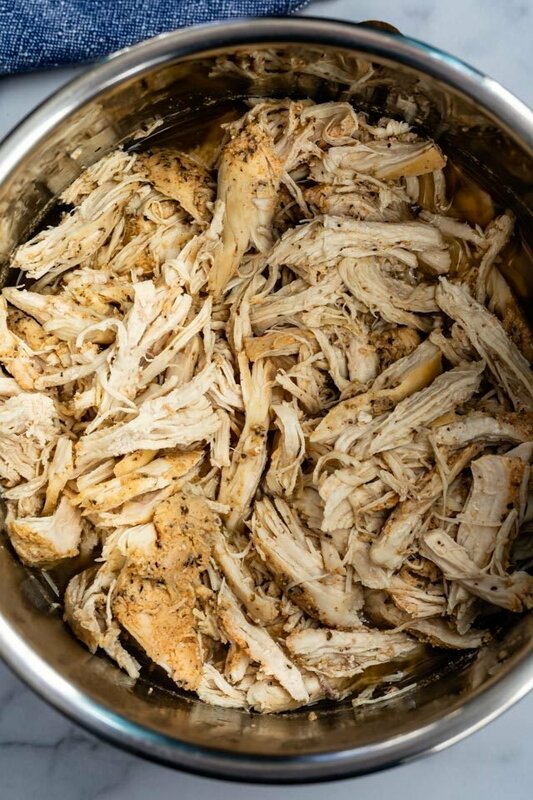 How long do you cook shredded chicken in the Instant Pot? I set my instant pot to HIGH pressure and set it for 10 minutes. Then I do a natural release for 10 minutes after the timer has counted down. 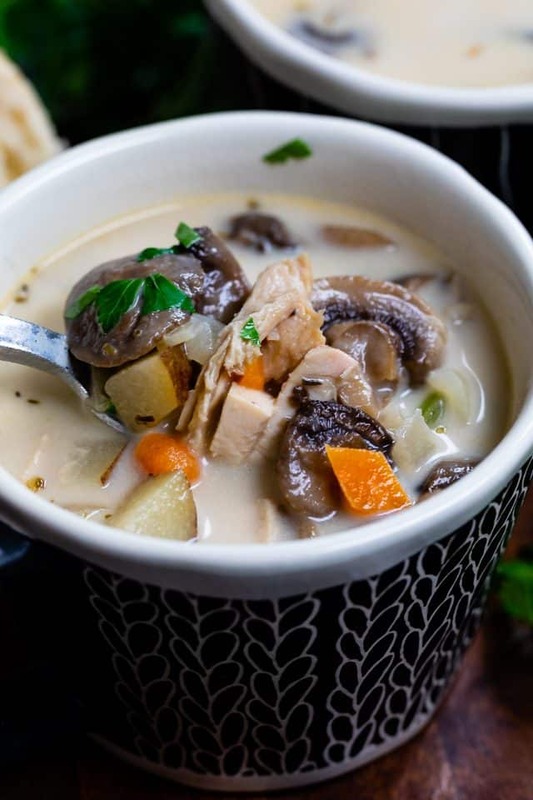 Can you use frozen chicken in the instant pot? Yes! That is the genius of the electric pressure cookers: you can make shredded chicken in the Instant Pot from frozen chicken! Tip: make sure your chicken breasts are frozen as singles (i.e. not a block of frozen chicken breasts). The pot may have trouble coming to pressure and/or cooking the chicken all the way if it’s in a big clump. The only difference when making thawed chicken vs. frozen chicken in the Instant Pot is the time it takes to come up to pressure. Still set it for 10 minutes; the pot will just take longer to come up to pressure with frozen chicken. Once you’ve naturally released your chicken for 10 minutes, remove it and shred it. Serve it or prepare it for meal prep or future dinners. How do you store shredded chicken? The best way to store your shredded chicken is in an airtight container in the refrigerator in some of the cooking liquid to keep it moist. You can keep this in one big bowl or portion it into servings, just add some liquid to the bottom of the container. Get yourself a pressure cooker or Instant Pot. Make sure to use enough liquid in the bottom. Season your chicken! Seasoning makes all the difference. Thawed or frozen, cook it the same amount of time and use a natural release. Store it in a bit of the cooking liquid to keep it soft. Ways to use this Instant Pot Shredded Chicken; make a big batch of this on Sunday and use it in dinners all week! Place chicken broth and pineapple juice in the bottom of Instant Pot insert. You don’t need to use the rack for this recipe. Stir together all seasonings and sprinkle generously over both sides of the chicken. Place chicken in the liquid. 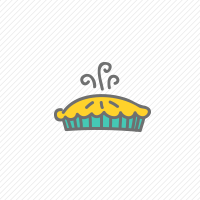 Place the lid on the Instant Pot and lock, make sure the seal is set to closed so the steam will stay in. Press “pressure cook” or “on” and set the pressure to high for 10 minutes. On newer models, turn off the “warm” setting so the machine will start. It will take about 10 minutes to come to pressure, then the countdown will start for the 10 minute timer. When the machine is done, let it naturally release for 10 minutes. Use a kitchen utensil to open the valve and let any steam out of the pot. Unlock the lid and remove the chicken. Shred with two forks. 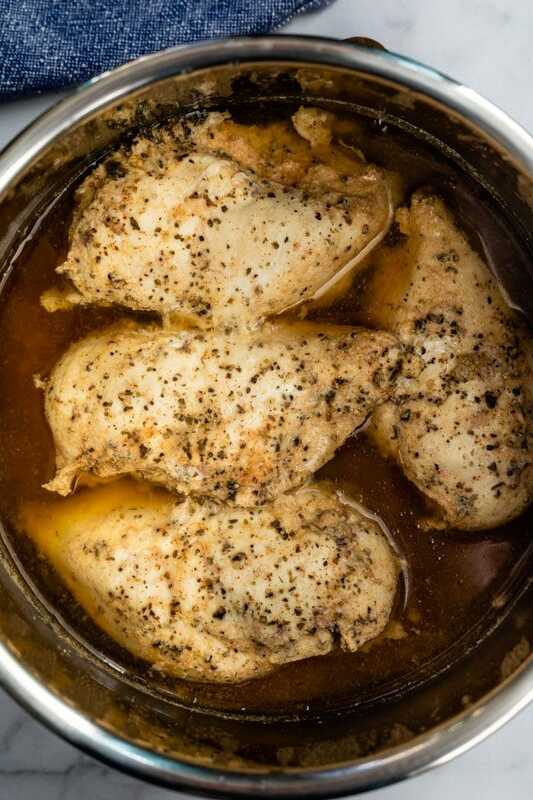 Store chicken in an airtight container with some of the cooking liquid to keep it moist. Will keep up to 3-4 days in refrigerator. This is a great recipe to use to meal prep lunches and quick dinners during the week. For frozen chicken: I recommend that you freeze your chicken breasts in singles. (If the chicken breasts are just one big block of frozen chicken the machine may have trouble cooking it properly or coming to pressure). Instead of seasoning the frozen chicken breasts, just add the spices to the liquid in the pot. The cook time will still be 10 minutes but it will take longer to come to pressure. If you don’t have pineapple juice you can just add more chicken broth, or omit. This recipe sounds great! I don’t have a pressure cooker, would you please tell me how to prepare in a slow cooker? Thanks so much.